Of significant historical interest, our small-scale portrait of Prince James Edward Stuart is a riduzione or ricordo of the larger prime version also with The Weiss Gallery (2011). As in the case of the original, this riduzione was painted by Antonio David, and commissioned by one of the Old Pretender’s close supporters. As an icon of the Jacobite cause, James Francis Edward Stuart was the subject of numerous works of art during his lifetime. Few however, stand as singularly vibrant as the outstandingly accomplished portrait by David. As an official portrait painter of the exiled Jacobite court in Rome, David formed a close acquaintance with the Stuarts after they decamped to Rome in early 1717. Pre-eminent amongst Italian portraitists, David worked almost exclusively for the House of Stuart for nearly twenty years, also painting the Old Pretender’s two children Prince Charles Edward Stuart, the Young Pretender (1720 – 1788) and Prince Henry Benedict, Cardinal York (1725 – 1807), both painted circa 1732 (Scottish National Portrait Gallery, Edinburgh). by whom bequeathed to Major William Baird (1879 – 1933), Lennoxlove House; thence by descent. We would like to thank Dr Edward T. Corp for his assistance with the provenance of this portrait. Sir David Nairne was the Secretary of the King’s Closet and was responsible for handling correspondence from Jacobite supporters to Antonio David’s studio regarding the commissioning of copies of his portraits. He also obtained the warrant for David to become James III’s official portrait painter. As a result, the present portrait was gifted directly from the artist to Nairne. Glasgow, Kelvingrove Art Gallery and Museum, The Palace of History: Scottish Exhibition of National History, Art and Industry, 1911. Dr. E. Corp, The Jacobites at Urbino, London 2009, pp. 23-25, 68, 87 & 90. This half-length portrait, painted at the inauguration of David’s association with the Pretender, features him in a fashionably high-peaked wig and donning a lacy cravat above a highly sheened ceremonial breast-plate. An appearance of splendour is increased by the red velvet and fur cloak on which are incorporated the sitter’s distinctions: the blue of the Garter and the rich greens and gold of the Thistle. With David’s emphasis on texture, opulence and colour he achieves a representation which epitomises kingly magnificence and rivals the portraiture of James’s French contemporary, Louis XV; more pertinently, it would have also successfully eclipsed the comparatively lack-luster likenesses of Queen Anne and George I across the channel. The incorporation of James’s Orders would seem to facilitate the dating of this portrait to post c.1717. Having returned from his unsuccessful campaign in Scotland in 1716, and wishing to recognise the efforts of his Jacobite supporters, James for the first time chose to display the Order of the Thistle as well as the Order of the Garter on his chest. Where previously these Orders were incompatible if worn together, new regulations issued from Avignon in April 1716 decreed that the Thistle could now be worn with the Sash. After secretly arriving in France with his mother, Mary of Modena in 1688, James Edward, who was the only son of James II (1633 – 1701), spent his earliest years under the protection of Louis XIV. 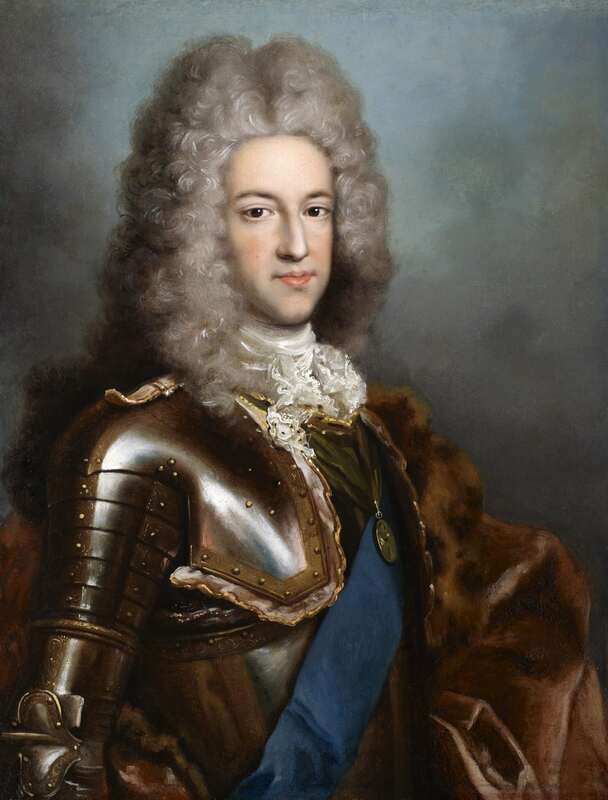 After his father’s death in 1701 James Edward was declared King by Stuart supporters and later attempted officially to claim his title by landing in Scotland in 1715. On his failure, he was offered refuge in Rome by Pope Clement XI, and given the Palazzo Muti as his residence. Continuing their legacy of artistic patronage the Stuarts made their court in Rome an important centre for painting, employing the greatest Italian portraitists, not only including David, but also Francesco Trevisani, Louis-Gabriel Blanchet and Rosalba Carriera. Portraits were a central ingredient of the long campaign of political propaganda to win support for the Jacobite cause, and were disseminated throughout Europe to James’s supporters. The Monarch and Saint are shining there. P. Monod, Jacobitism and the English people 1688-1788, 1989, p.70.